The town of Tetbury is in the Gloucestershire Cotswolds and is proud of its 1300 years of recorded history since 681 when Tetta's Monastery was mentioned in a charter by King Ethelred of Mercia. In the Middle Ages, Tetbury was an important market town for the Cotswolds wool trade and the town centre is still dominated by the splendid pillared Market House built in 1655 (see main picture above). The town is known as an 'architectural gem' as many of the wool merchants houses still look as they did 300 years ago. 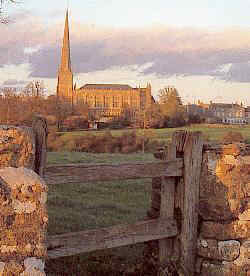 Tetbury is well known for its 25 antique shops and its close proximity to Prince Charles's residence of Highgrove. The town has a wonderful variety of shops including many specialist shops offering a wide choice. Many of the shops are individually owned where you will receive personal attention of the owner and experience a level of service long since vanished from many high streets. Several of Tetbury's retailers have received national awards for excellence and the visitor will notice that many of the towns businesses bear the Prince of Wales feathers as a sign that they hold the Royal Warrant. The market town of Tetbury has a wide choice of tea shops, bistros, cafes, pubs and restaurants which offer a good choice of food and drink. The church was built by Francis Hiorn between 1777 and 1781. The church has been described as 'one of the best Georgian Gothic designs'. Extensive renovation work has restored the interior to its original 18th century splendour. The church spire is the fourth highest in England. The building is open to visitors daily and houses the Tetbury Heritage Display. The Chipping, meaning market (see also Chipping Campden and Chipping Norton), was for centuries the site of the Mop Fairs where local farm hands, labourers, and domestic staff offered themselves for employment. 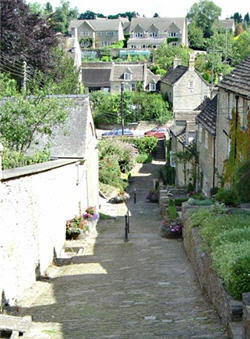 THE CHIPPING STEPS CLIMB FROM LOWER TETBURY PAST LITTLE HALL COTTAGE TO THE MARKET HOUSE ON THE TOWN SQUARE. Many of the surrounding buildings have medieval origins. In the North east corner of the town steep cobbled steps and weavers cottages retain a bye gone charm and ambience. In summer the steps are particularly attractive with an abundance of floral displays provided by the local residents and Town Council. Chavenage House, near Tetbury was a Filming location for the BBC's 'Lark Rise to Candleford' and 'Tess of the D'Urbervilles'. Walk around the Town - The town has many historic listed buildings in several Cotswold styles. Gumstool Hill is nearby - famous for the woolsack races. 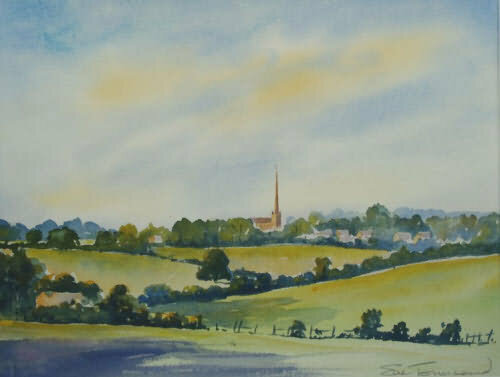 St. Mary's church on the outskirts of the town has the fourth highest Spire in England. Antique Shopping - Antique shops (about 25) are Tetbury's main contribution to tourism with most located in Long Street and the rest in Church Street or New Church Street. 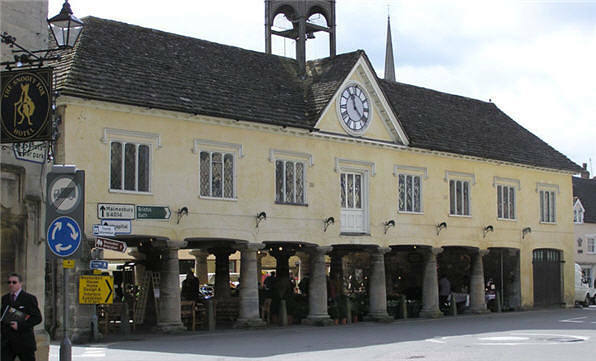 Market House - This building is Tetbury's distinguishing secular feature and is the best survival of a pilloried market house in England. A general market takes place here every Wednesday and a Women's Institute market on Friday mornings. Ramble along the Rail Lands - The rail land park and country walk was created in 2002 along the line of the former railway between Kemble junction and Tetbury. The country walk runs between Wiltshire Bridge, close to the town centre, and Preston Park. There are wooded areas, colourful planted sections in season, and picnic spots. Westonbirt Arboretum - The National Arboretum, is located three miles from the traditional Cotswolds market town of Tetbury. 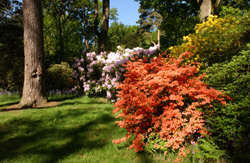 Westonbirt is an historic, Victorian picturesque landscape and an internationally important tree and shrub collection. It is managed by the Forestry Commission. Woolsack Races - at Gumstool Hill on Springbank Holiday Monday. Teams race each other as they carry a 65lb bale of wool from the market square and back again. 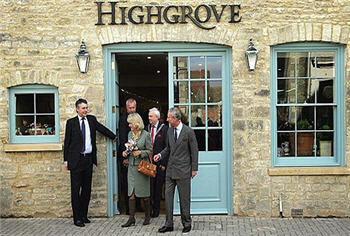 Highgrove Gardens - 23,000 people visit the gardens each year, and there is a two-year waiting list. Home Farm, at Highgrove, supplies organic vegetable boxes to 140 local families. Tetbury High Street (March 2008) that will sell produce from the gardens of their Highgrove estate.